This straightforward method of reasoning can often help one gain a better understanding of the intricate – yet ubiquitous – financial products of today. When applying the reasoning above, in the context of liquidity, it is discovered that a municipal bond mutual fund or ETF is surely not a bond (duck). The underlying assets are bonds, but the trading vehicle is far from a bond. The sometimes perceived “enhanced” liquidity ascribed to bond mutual funds compared to individual bonds, often has caused investors to experience greater loss in turbulent markets. Today’s market experts, from Howard Marks to Carl Icahn, have all recently warned about this paradigm and the dangers of illiquid mutual investment vehicles. In our experience, a separate account portfolio – where individual bonds are directly owned – is an advantageous bond portfolio structure in both stable and volatile times. The “mutualization” of the financial securities market in a little over a decade has been enormous. Total net assets in ETFs have grown from $119 billion in 2003 to over $1.4 Trillion today. These funds essentially are the market. The growth of ETFs and mutual funds has many benefits for investors. Mutual investment vehicles enable scale, often decreasing costs and facilitating access to unique assets and strategies. For bond mutual-funds, “stock-like” liquidity is also a marketed benefit. However, there is an inherent mismatch between the daily liquidity of the vehicle and trading activity of the underlying assets (the duck has a tail fin). Bill Gross referred to this as a “liquidity illusion” in his most recent market commentary. Liquidity exists in stable markets due to a balance of buyers and sellers. However, ETF liquidity is challenged (as displayed in 2008, 2009, and 2013) in times of market volatility. To put it more simply, mutual investors sell at fast-paced equity speeds when the off-ramps are more gradual-paced bond speeds. In this environment price has to give way for liquidity. In times of market stress, our separate accounts outperformed major ETFs, as the ETFs demonstrated the shortcomings of their structure. For example, during the “taper tantrum” in June 2013, the Net Asset Value (NAV) discount on the MUB (the largest ETF that tracks the municipal market) was as large as 2.85%. 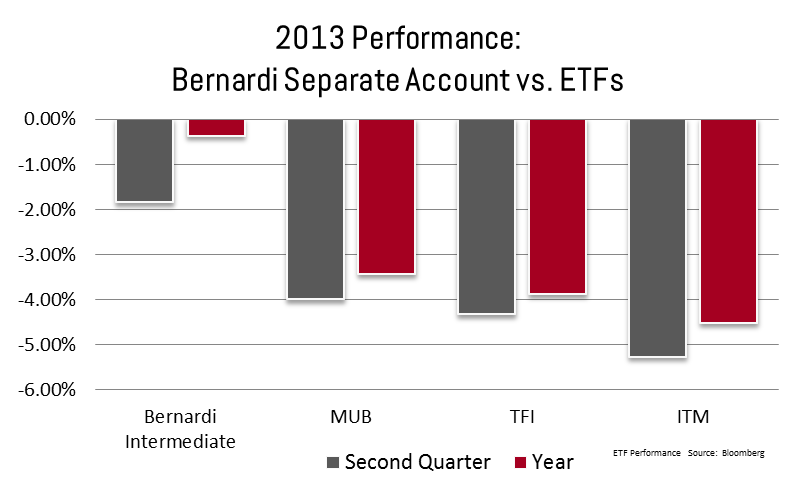 In 2013 our intermediate separate account portfolios were better able to weather the storm and outperformed during that quarter and over the course of the year (see chart). Since 2013, ETFs and mutual funds have grown significantly and represent a larger share of the market. This growth has occurred as the underlying liquidity of bonds has dropped as banks have been forced to reduce their proprietary trading and overall market making activities. In response to concerns about the liquidity of the mutual funds in a bear market, fund managers have established a number of safeguards to protect against potential illiquid markets. These include larger cash balances, the use of derivatives, or even lines-of-credit to help fund investor withdrawals. In our opinion, such safeguards reduce return and increase costs. Mutual funds certainly can serve an important purpose in any investor’s portfolio, for both return and diversification purposes. But ducks can naturally only fly so fast – it is not possible to repackage an asset and enhance the liquidity without taking on structural risk or additional costs. In our opinion, most of the vehicles currently available are a blend of both. On the other hand, a separate account portfolio, composed of laddered, individual bonds, only needs to remain as liquid as your individual circumstances demand and is not based on other’s liquidity droughts. At Bernardi Securities, we do not strive to scale our portfolio management process to a one-size-fits-all, mutually-owned product. In effect, the separate account allows for greater control and ability to customize. I hope this information is helpful and if you have any comments or questions, please do not hesitate to contact your Investment Specialist or Portfolio Manager.